The Princeton Review realizes that acing the TOEFL is very different from getting straight A's in school. We don't try to teach you everything there is to know about Englishonly what you'll need to score higher on the exam. There's a big difference. In Cracking the TOEFL, we'll teach you how to think like the test writers and Eliminate answer choices that look right but are planted to fool you Ace the Structure and Writing sections by remembering a few basic grammar rules Use vocal emphasis cues to master Listening questions Use Process of Elimination to score higher on Sentence Completion and Error Identification questions This book includes a full-length simulated TOEFL exam, plus an audio CD with Listening exercises and a full transcript. The questions and exercises are like the ones you'll see on the actual TOEFL. 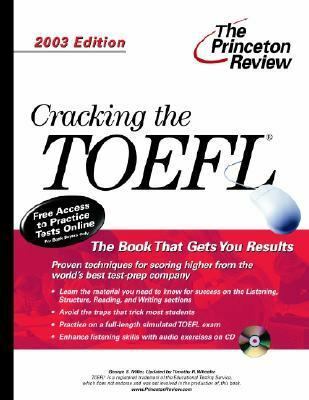 We also give book buyers online access to full-length simulated TOEFL exams, complete with instant score reporting and answer explanations.Miller, Elizabeth is the author of 'Cracking the Toefl Cbt 2003' with ISBN 9780375762758 and ISBN 0375762752. Loading marketplace prices 2 copies from $14.95 How does the rental process work?